A handsome folio-style iPad 2 case made from cowhide leather, this case from AYL allows you to stand it upright, in a slanted position for movies, and a lower position for comfortable typing. Extremely thin and lightweight, it features nice, sturdy-looking stitching and construction. 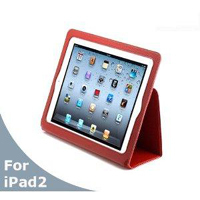 We like how it closes securely with a magnetic clasp and it automatically awakens or puts to sleep your iPad 2. It’s also nice to have a variety of colors to choose from: red, brown, and black. Professionals and students will appreciate the protection it offers from most scrapes and scratches. It’s available for $34.